In just a 30-day period this spring I will attend three museum or archaeology conferences – the Tennessee Association of Museums, the Society for American Archaeology, and the American Association of Museums. An aspect of these annual events I enjoy are the expo and poster sessions. They offer an opportunity to engage with a range of ideas and to interact one-on-one with folks. These experiences go beyond listening to papers, that while often are very interesting, tend to be more monologues where one could just as easily read the book. Expo events provide the opportunity to see the latest gadgets and digital wizardry in the field. I am curious about how I will react to these displays this year – particularly since over this past year, when I have focused on the idea of building engaged and sustainable programs. At the recent Tennessee Association of Museums meeting, I organized a session The Participatory Museum: More Than Just a Hands-on Gig. In my introductory paper for the session, the prime example of a sustainable and engaging museum I presented was one I have blogged before about – The Pearl Button Museum in Muscatine, Iowa. I used this museum as an example in part because the institution is ridiculously low-tech – there is not a touch table, video monitor, audio tour, and as of when I gave the paper, no mobile app for the museum. The Pearl Button Museum demonstrates that building sustainable and engaging institutions does not require increased funding for the latest in digital technology. My earlier post explores what makes this place so engaging and participatory. The Tenement Museum on the Lower East Side of Manhattan in New York strikes me as another prime low-tech high impact cultural venue. African American students who created an exhibit on their neighborhood for the C.H. Nash Museum in 2010 made a similar observation. During the five weeks of the project they visited several area Memphis Museums including the Pink Palace, the Brooks Museum, the National Civil Rights Museum, the Stax Museum of American Soul Music, and Davies Manor Plantation. I was surprised that for many of the students their favorite museum visit was Davies Manor. At Davies the sole “digital” exhibit is an eight minute intro video shown on a small television monitor in a cramped reception room. One of the students, Jasmine Morrison, explained that what was so powerful for her during the visit was standing in the big house on the plantation where her enslaved ancestors would not have been permitted to enter. This past week the AmeriCorps Team now stationed at the C.H. 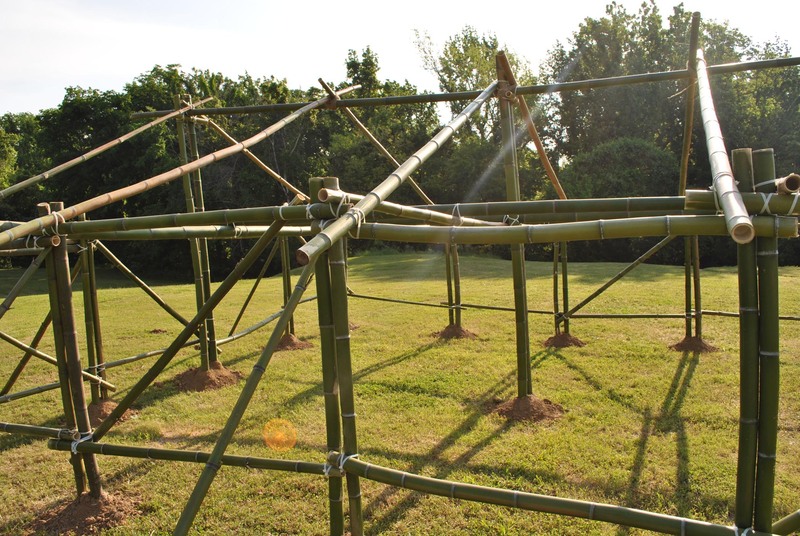 Nash Museum erected a ghost house out of bamboo on top of one of the prehistoric mounds. We decided to erect the house as a no impact, easily built structure, that used materials already on site, as a representation of a house that would have stood atop the prehistoric mound in prehistory. This past Saturday I was pleased that this rather simple structure proved to fulfill that purpose for our visitors. What these low-tech solutions teach me is that we do not need to fall into a trap of thinking that we need high-tech digital solutions to carry out our mission or attract visitors. We must first allow the visitor to be filled with the sense of time, place, and meaning of their surroundings. With such engaging programs in place, we then can move to consider how digital technology might enhance the presentation. Pragmatically, as low-tech solutions are often the most readily employed by cultural institutions already on a shoe-string budget, for that reason, they also remain an excellent starting point. How do you use low-tech solutions to tell your story? This is very empowering to hear as so many of us in museums are working with little to no dollar budgets. I’d love to hear more about specific examples/activities in museums using little to no-tech activities to engage visitors. Do you have any others off the top of your head (and sorry I’m not included any low-tech solutions myself….)? 1) Young students in particular enjoy that which is real. I had an interesting experience about 15 years ago that resonates to this day. When I was the Station Archaeologist at Poverty Point site in NE Lousiana, on a couple days each year the Office of State Parks had school days where they would run about 1000 students per day through the site. There would be about 10 stations set-up around the site area where groups of 40-50 students at a time would pass through for 20 minute or so presentations. The students were shuttled through in a near military fashion. This was not an ideal way to engage children, but that was the policy at the time. As the archaeologist at the site, I was of course at the Archaeology Station. I would do a show and tell about how archaeologists went about doing their work. After about 15 minutes, even the best of students started getting antsy. Then I would start to explain flotation analysis – boring, right? I would scoop out the “light fraction” from a barrell of water and walk the small bits of seeds and bone down the line of students and explain “This was not “like” what the people were eating here 3500 years ago, this “is” what they were eating” and then I explained how we can identify bones and seeds left in garbage, what happens today when you throw an apple in the garbage, etc. etc. The first time I tried this, a hush came over the students and they were extremely attentive. I wondered if it was a fluke. I have repeated that process a hundred times since then, ending my show-and-tell with flotation analysis, and always with identical results. My takeaway on this is that our archaeological facilities are loaded with artifacts. At the C.H. Nash Museum we have over 50 cubic feet of prehistoric materials (lithic, ceramics, animal bone) that have no provenience information, we have no idea where they came from, and we have deaccessioned them to be used in educational collections. I argue that real, when it is known to be real, trumps plastic replicas every time. This reality is not lost on students either. When I take prehistoric artifacts into a classroom setting and say something like “This is likely the oldest thing made by a human you have ever held. It has made it through the last 3000 years without breaking, so let’s be certain it makes it through this class period so that other students can share the experience.” In some 20 years of doing this, I have never had an artifact stolen or dropped. You can’t get much more low-tech than this! Another very low-tech experience that goes a very long way. I think that we often make assumptions about what folks want, but do not ask them. When I taught a surveying course at UIUC a bunch of years ago, I came across 10 alidades in the the storage room of the Anthro Department. I got them cleaned up and in good repair and decided that although digital Total Stations were the norm in surveying these days, starting the course off with alidades, where you actually draw the map on a plane table in the field while you are collecting the data points would be a fun exercise. The students loved it. The process was very intuitive in exploring how x,y, and z data are collected. Of course, the students would not be using alidades in the field outside of an in-class educational context, but this low-tech experiment was a big hit. Off of my soap box!